With the advent of digital media It has never been so easy to manipulate images. At least some cgi (computer generated image) cards are a bit better than some models illustrated previously – and, linked to the previous topic, also better than models in films though the real thing is to be preferred. Even so the hand of editor can still be all too obvious whatever the technology used. Across the page are a few that went just a little bit wrong. Top right is a perfectly good shot of a Japan Airlines DC-8 at Hamburg with passengers boarding through an open rear door – published by German publisher Kruger (920/149). Someone at Kruger thought the tail and wing image would be good extracted and edited over aerial city views. I do not have an example to show but , believe me, they did not notice that the rear door is open …and so it appears on the manufactured “in flight” views. Wheels seem to cause a problem. There are quite a few examples of wheels being edited out of landing shots to make a full flight image. The 2 Iran 747SPs below are not actually identical so this may or may not be an edit from the same photo shoot. If so it is very well done. Its OK for low wing aircraft but you have to watch it on high wings. Bottom right, this Cubana F.27 has retained the wheel struts but the wheels themselves have been lost – at least with digital editing it would have been much easier to finish the job. As is shown by the vertical card. 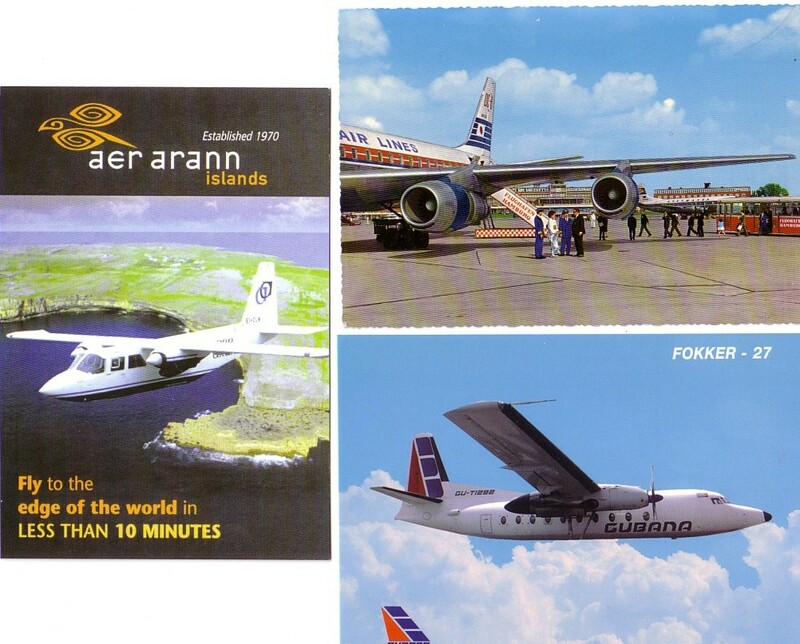 Presumably Aer Arann express, even though serving Irish offshore islands where the sturdiness of the landing gear would be thought important, were embarrassed by the old-fashioned nature of their fixed gear BN islander and chose to remove it. If they were equally disturbed by the piston engines I suppose they could have edited in the turboprop version- which at least exists in the real world. I wonder at what point the Irish version of the Trade Descriptions Act comes into play.